A forensic pathologist digs at the gruesome scene where the body of Sakhile Mabuya was found buried in a shallow grave. INSET: Sakhile, who was only 33 when he was killed – allegedly because he had not paid an outstanding debt. SAKHILE OWED the mashonisa R200 and the mashonisa’s friends were seen at his shack. Then Sakhile disappeared and rumours started that he may have been kidnapped. THEN MURDER AND MAYHEM FOLLOWED. Nine days after 33-year-old Sakhile Mabuya disappeared, his body was found in the bush near Majazana, in the Vaal, south of Joburg on Monday afternoon. His little finger was sticking out of the shallow grave. His eyes were missing and his hands had been cut open with razor blades found at the scene. It appears he was kidnapped, beaten, murdered and buried. Rumours started that a group of men sent by the mashonisa had kidnapped him from his rented shack because he owed R200. On Sunday, a day before his body was discovered, angry community members attacked the mashonisa’s husband and her brother-in-law. At that stage they didn’t think the mashonisa herself was involved in the murder. 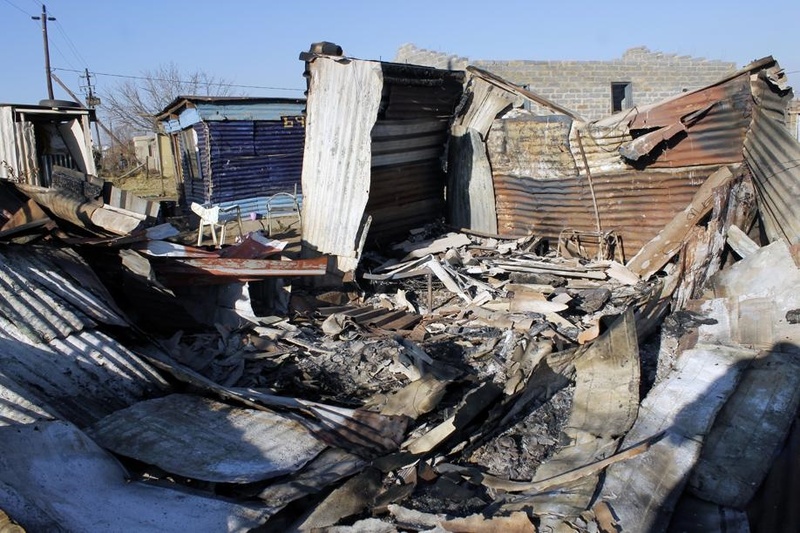 Angered by the gruesome discovery, residents attacked again, burning down six shacks and destroying an RDP belonging to the mashonisa and her friends. The mashonisa and her two friends, one of whom is a sangoma, have all reportedly fled to Lesotho. Angry residents told the SunTeam they believed the body was mutilated to get body parts for muthi. The sangoma’s tortoises and a rooster were killed and set on fire. Sakhile’s cousin, Ayanda Mabuya (30), said he was attacked two weeks ago but he escaped and opened a case. “The men were arrested but were later released after paying a bribe,” claimed Ayanda. Ayanda claimed a family friend called one of the men who works for the mashonisa and begged him to tell them where Sakhile was. She said one of the suspects is a man who lives close to the family. “Even after Sakhile’s disappearance he kept greeting and smiling at us, when he knew all along that Sakhile was dead,” she said. “My nephew died for R200,” believes Sakhile’s aunt, Zodwa Mabuya (56). Gauteng police spokesman Captain Mavela Masondo said police are investigating a case of kidnapping and murder. “Some of the suspects questioned are from Lesotho,” said Masondo. The mashonisa’s brother in-law has since been arrested and charged with Sakhile’s murder.